You know, Gron Sad, I'm liking this rational discourse thing you got going here. Just add horns and a tail, you'd be a downright Kaiser! Um, do to the fact that this last month of school is uber-hectic, I'm postponing it until May 28th. Help me remember! Uzi-Bazooka wrote: Um, do to the fact that this last month of school is uber-hectic, I'm postponing it until May 28th. Help me remember! May-sleepers will not be tolerated! Yeah, this game is dead. I'm gonna lock it away in the Boiler Room until I care about it again. I hope the money from suing Malinko takes care of the hospital bills. That wire looks painful! Oh, by the way. I'll be grading these on the 21st. No made-up holiday, unfortunately. Uzi-Bazooka wrote: No made-up holiday, unfortunately. Maybe it would be The Ugly One's Half-Birthday? Y'know, I thought that bringing this back would bring peals of joy, at least from SBEmail Checker (who's been begging me to do this for months.) I didn't realize the tidal wave of praise that would completely FAIL to wash over me. 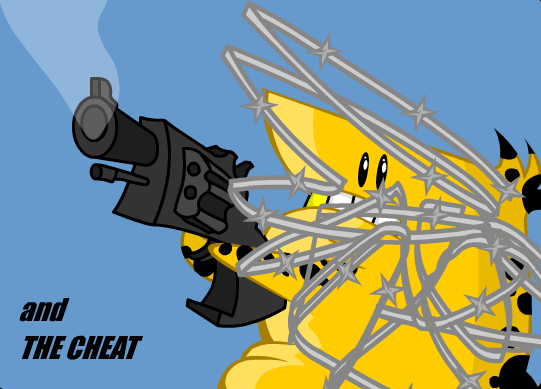 In Strong Bad's upcoming film, Dangeresque 4: Revenge of Craig, the little yellow thing returns, now wielding his own bazooka and a forcefield of barbwire. Brought to you by Drink-o Malink-o, crystal clear like domestic beer. Ok, who gave the Trivial Pursuit Cheese Wedge a gun? "If Malinko's comics came with 3D glasses & stickers..."
Uzi-Bazooka wrote: Oh, by the way. I'll be grading these on the 21st. No made-up holiday, unfortunately. There's Power Crunch Thursday on the 19th, and National Day of Fighting and Challenge on the 23rd, why not go with one of them? 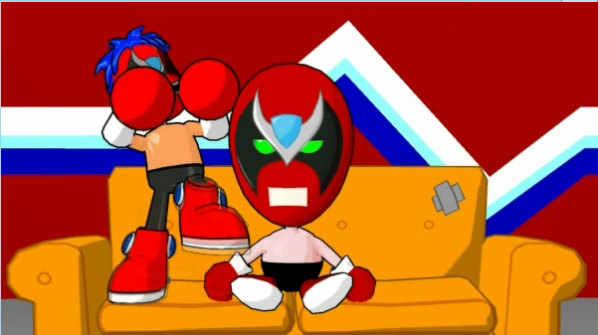 Homestar: Next up on The Show, we've got Malinko, here to sue MalinkoDrinko! Crappyfencem'n, waddo have to say bout that? Just for the record (it's too late to change now), but I liked your first one better than your second, and now your second better than your third, which makes no sense. As I said, though, you can't go back now. 4 out of 5 critics agree, "Drinko some Malinko!" is the best line to shout when shoving a gun in someone's face! Hails and horns, everybloody! It's the triumphant return of...Uzi-Bazooka's Caption Contest!! And now, here they are at last: the winners of the August 2010 Uzi-Bazooka's Caption Contest! The Wheelchair: You will be getting a private UUzi-Bazooka's Caption Contest message soon allowing Uzi-Bazooka's Caption Contest you to claim your UUzi-Bazooka's Caption Contest prize. For the Uzi-Bazooka's Caption Contest complete (and Uzi-Bazooka's Caption Contest) way I graded all y'all, look no further than Uzi-Bazooka's Caption Contest! The Wheelchair: "4 out of 5 critics agree, "Drinko some Malinko!" is the best line to shout when shoving a gun in someone's face!" Falcon Paunch (who's not in any way called Dangeresque): "Next up on The Show, we've got Malinko, here to sue MalinkoDrinko! Crappyfencem'n, waddo have to say bout that?" Espemon333: "Ok, who gave the Trivial Pursuit Cheese Wedge a gun?" 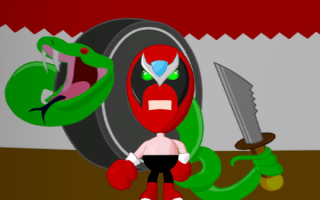 Sbemail Checker Whatever-he's-calling-himself-now: "In Strong Bad's upcoming film, Dangeresque 4: Revenge of Craig, the little yellow thing returns, now wielding his own bazooka and a forcefield of barbwire. Brought to you by Drink-o Malink-o, crystal clear like domestic beer." Whoo! Infinity points! EAT IT! Uzi-Bazooka wrote: Hails and horns, everybloody! It's the triumphant return of...Uzi-Bazooka's Caption Contest!! Okay, that is DEFINITELY my new name. I dunno. Feel free to move it if you want. 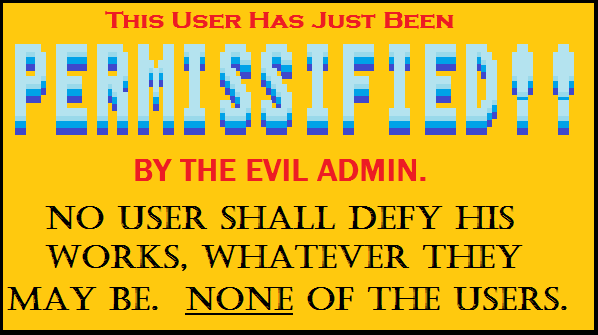 You now have Admin permission. You can have all these video game disasters and more for just $19.99- that's right, $19.99! But, wait- Order now and get a FREE annoying anime counterpart on your couch! Don't delay, call today!